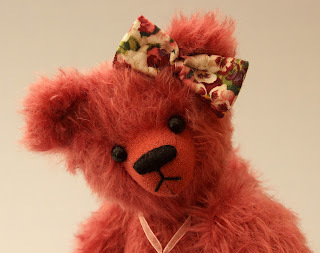 Silvie is a classic bear design. 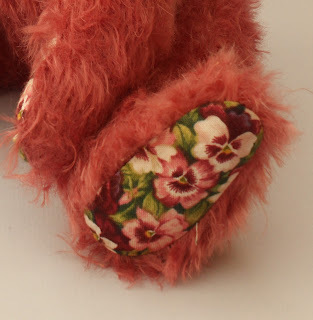 She is 30 centimeter tall and made from a dark pink coloured mohair with long hair, her paws are made from quilt fabric with violet design in the colours purple, pink and white. 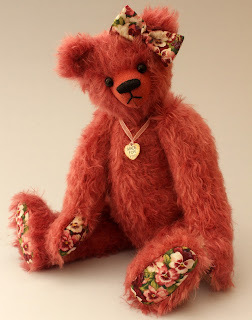 Silvie has big german glass eyes and a handstitched nose from black Perle yarn. In her hair she has a bow made from the same quilt fabric as her paws and on het neck she has a tag in hart shape. Silvie is five way jointed and filled with sheep wool and steel pellets so that she is having a little bit of weight. Silvie is a one of a kind Mirabeer and handmade, she comes with a certificate of originality. Silvie is looking for a new loving home where she get a lot of love and cuddles.